An Ordinary Meeting of the Bega Valley Shire Council will be held at Council Chambers, Bega on Wednesday, 1 May 2013 commencing at 2.00 pm to consider and resolve on the matters set out in the attached Agenda. That an apology from Cr Britten be accepted for his inability to attend the meeting. 12.3 Exhibition of response papers - social issues and cultural settings................ 42 . 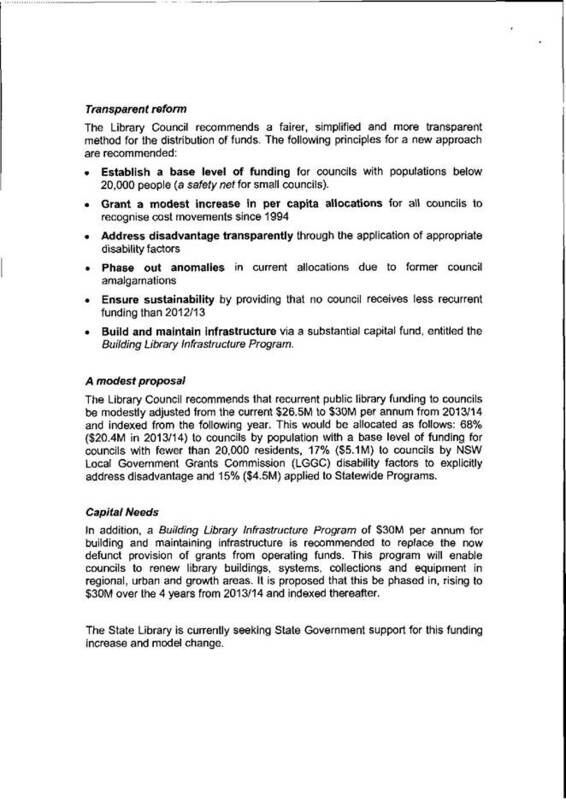 Council has been requested to support a Public Libraries NSW submission on the reform Public Library Funding requesting increased funding in the NSW State budget for public libraries. Council’s library service is funded via a number of sources including fees and specific grants, general rates, a special variation, funding from the University of Wollongong and minor recurrent funding from the NSW government. Council has also been successful in achieving Library Development Grants for Eden, Bermagui, Merimbula and Bega Libraries over the past 6 years. Since 2010, NSW government funding for public libraries has continued to diminish. If no action is taken it may be that in future budgets there will be no general library development grants and subsequent impact on the recurrent subsidy funds. · Building and maintaining infrastructure via a new capital fund. Public Libraries NSW (of which Bega Valley Shire Council is a member) have requested that member Councils resolve to support a funding reform proposal prepared by Public Libraries NSW, NSW Metropolitan Libraries Association and the State Library of NSW and endorsed by the Library Council of NSW. A copy of the letter from the Chairman and the proposal are attached. The Bega Valley Library Service has approximately 21,000 members and services the community through branches, the mobile service, Books in Flight and the Home Library service. The partnership with the University of Wollongong and other educational institutions provides services to students across all age groups. The service is one of the best utilised and highly considered by the community as evidenced in the recent community survey. Issues for Council will continue to be how to develop and grow the service within tight budget constraints. The need to grow the NSW recurrent grant is critical. Under the terms of the Library Act 1939 and the Library Regulation 2010, the State Library of NSW administers funding to NSW public libraries, on an annual basis. The Library Act 1939 sets out that the Library Council of NSW advises the Minster for the Arts on matters of public library policy and administration and the provision of assistance to local libraries. The NSW State Government currently provides $26.5M annually to local government in support of public libraries. 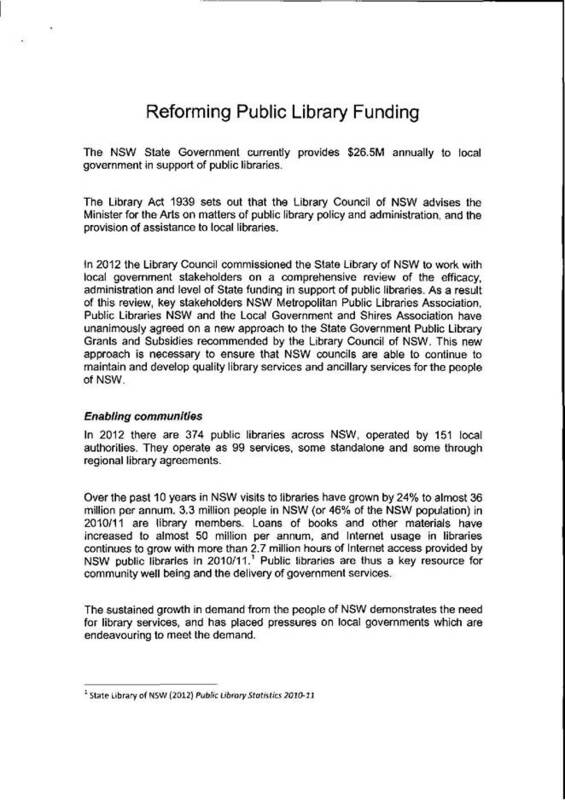 The sustained growth in demand from the people of NSW demonstrates the need for library services and has placed pressures on local governments which are endeavouring to meet the demand. 3.3 million people in NSW are library members, loans of books have increased to 50 million per annum and Internet usage has grown to 2.7 million hours in 2010/11. Public libraries are a key resource for community well-being and the delivery of government services. It is critical that government funding not be reduced and that in fact it should be increased. The new funding model addresses disadvantage transparently by applying appropriate disability factors. This should attract the support of local State member, the Hon Andrew Constance MP, who is Minister for Disability Services. The Library Development Grants are key to continuing to ensure that library services are able to support education and community activities in local areas. Funding to Bega Valley Shire Council over the past has been received for the internal work and furniture at Merimbula and Bermagui, works in Eden, and the new RFID self scanning project established in Bega in December 2012. The new funding model includes a Building Library Infrastructure Program of $30m over 4 years (rather than grants provision) for building and maintaining infrastructure. This is to be used for the renewal of library buildings, systems, collections and equipment and will dovetail with the Council’s Long-Term Financial Plan’s focus on renewal of community assets. The current public library funding in NSW is $26.5 million. The current financial recurrent support for the Bega Valley Library Service from the NSW government is $105,888 as outlined below. The Library Council recommendation is that this amount be adjusted to $30 million from 2013/14 and indexed from the following year - 68% of this would be allocated to councils by population; 17% by the NSW Local Government Grants Commission disability factors to explicitly address disadvantage and 15% be applied to Statewide Programs. 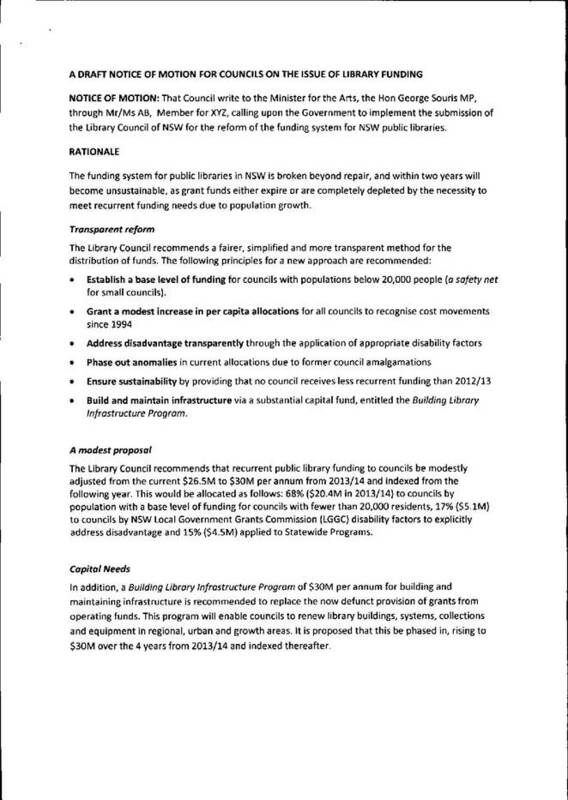 In addition it is proposed that a $30 million Building Library Infrastructure Program for building and infrastructure be established to replace the provision of grants from operating funds. Sustainable continuation of high-quality library facilities is a key community service contributing to the wellbeing and quality of life of Bega Valley Shire residents. The Bega Valley can only benefit from the adoption of the proposed public library funding reforms. The motion proposed by the Public Libraries New South Wales and its partner organisations is contained in the recommendation. 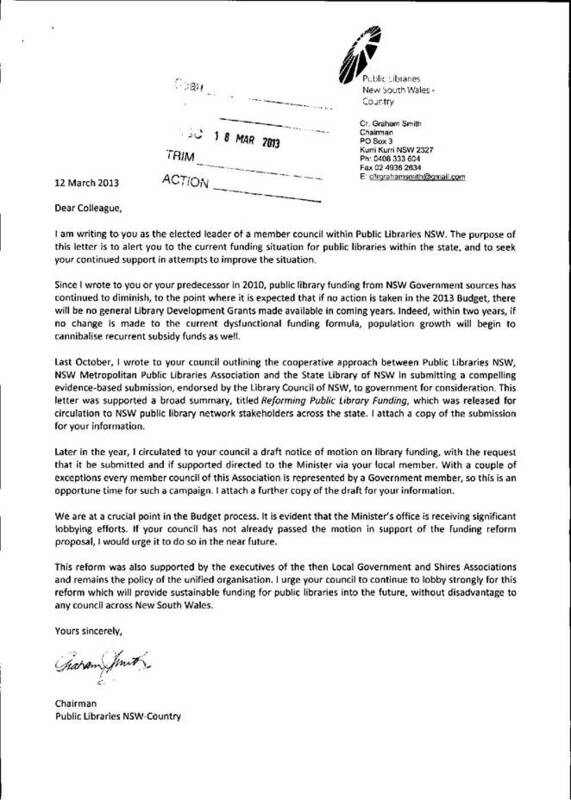 The full letter and “Reforming Public Library Funding” summary is attached. The National Legislation covering vacation care changed in 2012. Council has reviewed compliance and identified issues in relation to the Bega Vacation Care program which require changes to the program. Bega Valley Shire Council is the legal Approved Provider for two out of school hours programs for children aged 6 – 12 years. Families using these services contribute to the economic and social sustainability of the Bega Community through work, study and volunteering. In 2012, National Children’s Services Law, Regulation and Quality Standards were introduced across Australia. For the first time in NSW, Out of School Hours programs became regulated. The introduction of National Law coincided with the closure of Bega West Public School and a transfer of the Vacation Care program to Bega Valley Public School. The After School and Vacation Care programs and their venues are now required to comply with the Law for certification of premises and staff, participation in quality processes, compliance, inspection and audit assessments of programs, children’s health and safety, physical environment, leadership and management, and records. However, the school site presents increased exposure to legal, health and safety risks and financial penalties for BVSC as Approved Provider of the Vacation Care program. These risks are largely connected to operating the Vacation Care program from a site not under BVSC’s care and control. An injection of funds from BVSC would be needed to continue to operate an affordable program from the Bega Valley Public School site. These funds would be used to employ additional qualified staff to minimise some of the environmental risks, and to manage the duplicated operational requirement including compliance and reporting tasks. The program would also need to recruit a qualified and certified educator for the statutory position of Nominated Supervisor. Even with these measures in place, there would still be uncontrolled risks associated with operating the Vacation Care program from a venue not owned by BVSC. No alternate Bega sites have been identified that are under the care and control of BVSC and meet the requirements under the new Law and Regulations for school age programs. If Council wishes to continue to provide an extended Vacation Care program they would need to identify a site and allocate rate revenue to cover the cost of major building and grounds works to ensure the site’s compliance with Law and Regulations. The future development of the Bega Town Hall site may provide a venue however there is no designated outdoor space and the development is still some time off. While a change of venue for Vacation Care does not avoid duplication of all fees and charges, there will be cost savings associated with the need for fewer qualified staff. The remaining savings would be redirected to cover duplication of administrative/ management processes at Bandara. Increased costs and risks can be managed more effectively by relocating Vacation Care to Bandara Children’s Services with a reduced number of places. The cost savings achieved by transferring Vacation Care to Bandara can be passed on to families in reduced fees. 1. That Council resolve to continue operating After School Care without change, from Bandara Children’s Services. 2. That staff investigate vacation Care transfer from Bega Valley Public School to Bandara Children’s Services and continue to operate the program at 10 places. 3. That appropriate staffing reallocation and responsibilities be managed to ensure compliance with legislation and Council’s procedures relating to any change. 4. That fees for the program be reviewed accordingly and reported to Council for advertising and adoption. 5. That staff continue to explore other viable options for the provision of school aged programs in Bega for children aged 6 – 12 years. This report recommends that Council adopt the advice of the Bega Valley Local Traffic Committee meeting held on 3 April 2013. The Bega Valley Local Traffic Committee held a meeting on 3 April 2013, the minutes of which have been distributed separately. It is a requirement that Council formally adopts the recommendations, prior to action being taken. All recommendations were supported unanimously by the Committee. This report details the outcome of the evaluation of Tender 10/13 for the processing of vegetation and timber waste and recommends award to the preferred tenderer. Council requires periodic shredding/mulching services for vegetation and timber waste disposed of at Council’s waste and recycling depots. The shredded material is recycled through use onsite and is also made available to residential customers at no charge for use in gardens. Council also has occasional requirements for this service at construction sites, where substantial vegetation clearing is required. Historically, Council has undertaken this activity on a quotation basis for one off services. The administrative burden of procuring services in this way is such that a longer term tendered service is more desirable. The tendered services are for a proposed contract period of three years. The tender process complies with the Local Government Act 1993. Council’s waste facility licences, where applicable, permit mulching of wood waste and garden waste. Elsewhere the activity is conducted with lawful authority in compliance with the requirements of the Environmental Planning and Assessment Act 1979 and the Protection of the Environment Operations Act 1997. The proposed service helps meet the objectives of Council’s Waste Services Policy. Recycling garden and timber waste has environmental benefits, in terms of recycling material which might otherwise be burned or sent to landfill. The activity has sustainability benefits, in terms of returning organic carbon to the soil. By diverting organic waste from landfill, the activity helps to avoid the generation of methane, thus reducing greenhouse gas emissions and reducing the rate of consumption of landfill space. The activity is in accordance with Council’s 2020 Vision on Waste Strategy. The activity is budgeted for and will be funded from the waste management revenue. The tender is on a schedule of rates basis and the exact cost will vary, dependant on quantities from year to year. The services are fully contracted and do not have additional staffing implications. The services are part of the operational plan. Periodic vegetation and timber waste processing services are beneficial to the community and are vital to the proper functioning of Council’s waste depots. A tender process has been implemented that secures these services at a competitive rate for a period of three years. 1. That Council accept the tender from (insert) in relation to contract for the works described in Tender 10/13, in the approximate amount of $(Insert) over three years (excluding GST), subject to variations and provisional sums. 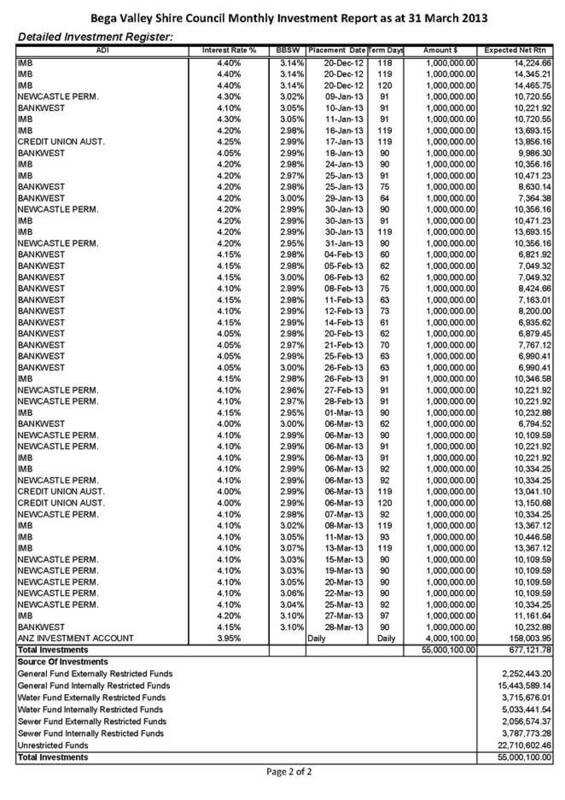 To report the details of Council’s investments during the month of March 2013. Council is required to exhibit its proposed draft fees and charges for 2013 - 2014 for a period of 28 days as a part of the Integrated Planning and Reporting framework. The Council determines fees and charges for a range of services such as planning and building, library, and children’s services and facility usage. The fees and charges proposed for these services and facilities for the 2013 -14 year are detailed in the draft fees and charges document, and are aligned to Council’s pricing policy, some of which are set by statute. Management committees have been provided the opportunity to submit their draft fees for 2013-14. This includes the fees for halls and sportsgrounds. Water and sewer charges are currently on exhibition in conjunction with the revision of the strategic business plans and related development servicing plan. Consideration of those plans will influence the s64 headwork’s charges and subsequently the typical residential bills for water and sewer. Water and sewer charges are included in the fees and charges document in alignment with current exhibition. The draft fees and charges progresses Council’s currently adopted long term plans. Public exhibition period will take place from 2nd May 2013 to 20th May 2013. Draft fees and charges will be made available on Council website and in hard copy at Zingel Place Council office and all library branches. Advertisement of exhibition period will be through print media, website and social media. The Council is required to public exhibit its draft fees and charges for a period of 28 days. Exhibition period from 2nd May 2013 to 30th May 2013. Council will consider all feedback and formal responses at an Extraordinary meeting on 26th June 2013. Council placed its social issues and cultural settings papers on public exhibition in December 2012. Following the exhibition period draft response papers have been prepared to inform the review of the community strategic plan. The NSW Government has established Integrated Planning and Reporting (IP&R) legislation, requiring all councils to establish a long term strategic, infrastructure and financial framework. Council is required to formally review and exhibit the community strategic plan in the year following an ordinary election. To date Council has signalled no change to the CSP, unless the rates variation is not approved in full, which in turn would necessitate a revision of the relevant asset plans and long term financial plan. The newly elected Council has formally resolved on two occasions to continue with the planning regime in their current adopted form. It must however exhibit the community strategic plan updated in its new format. Council had resolved to do this following notification from the Independent Pricing and Regulatory Authority in relation to Council’s lodged Special Variation application. An updated draft of the community strategic plan will be presented to the Council meeting on 22 May 2013 for the purpose of gaining community feedback on the minor changes proposed, including incorporation of social and cultural issues outlined below. Through the transition to IP&R, the development of separate Social Plans and Cultural Plans were no longer mandated. Councils were encouraged to incorporate social and cultural issues into the community strategic planning process. Council’s previous Social and Cultural Plans informed the development of the adopted community strategic plan, Bega Valley 2030. In consultation with community, peak agencies and organisations, the Social Issues Papers and the Cultural Setting Report was developed and placed on public exhibition following the Council meeting on 12 December 2012. The Social Issues Papers were designed to give an overview of the social issues facing Volunteers, Aboriginal People, People from Cultural and Linguistically Diverse Backgrounds (CALD), People with a Disability, Older People, Men, Women and Young People in the Bega Valley. The Cultural Setting Report was designed as a document to inform on current cultural activity within the Shire, and identifies future opportunities and challenges of the cultural industry, community groups and Council. Draft response papers, the Cultural Settings Response and the Social Issues Response have been developed in response to the Cultural Setting Report and Social Issues Papers. 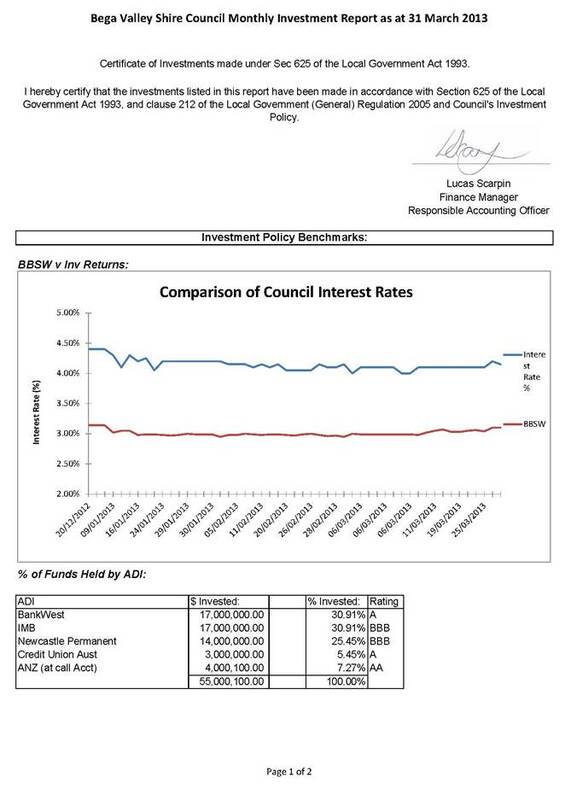 These have been separately circulated to Councillors. These responses identify Council’s roles and responsibilities in relation to key items under Council’s area of influence and responsibility. It is important that Council clearly articulate what activities it can resource and support and that expectations are not raised beyond the Council’s capacity to deliver. Clear targets and frameworks will then be developed in Council’s Delivery Program and Operational Plan to achieve the outcomes and outputs in its area of responsibility. Council is also a key partner with other agencies in some areas of the scope of these documents and this also needs to be reflected in the final IP&R reports adopted by Council. Since adoption of IP&R, the development and adoption of Social Plans is no longer mandatory. The Cultural Settings Response and the Social Issues Response have been developed in response to the Cultural Setting Report and Social Issues Papers and community needs and will serve as informing documents to the Council’s Integrated Planning and Reporting Framework. The process utilises Council’s adopted Community Engagement Policy and reflects the directions outlined in currently adopted policies under the Liveability theme. The Social Issues Response will assist Councillors in making informed decisions about the allocation of resources and the opportunity for Council to advocate on behalf of the community. The Cultural Settings Response aims to increase awareness and understanding of the significance and potential of the cultural life of our communities and to provide a platform for discussion with community, government and industry partnerships to enable cultural development, planning and support. The response papers clearly provide a key input into the review process for the Council’s community strategic plan and other aspects of the Council’s integrated planning and reporting framework. Council staff have continued liaison with key groups including the Council’s Cultural Planning Section 355 committee and focus groups. It is proposed to place these documents on public exhibition to allow for input during the process of finalising the community strategic plan review. The drafted response papers outline Council’s role, Council’s position in relation to key outcome areas and any related Council level of service or activity. The responses have been developed by staff in line with the adopted long term financial plan. The draft Social Issues Response and Cultural Settings Response have been developed in consultation with the relevant sectors of the community. The documents will serve to inform Council on appropriate responses to social issues and cultural activities within the Shire which are within Council’s area of influence and activity, and will assist Council in informing the review of the Community Strategic Plan.